Woo! Join us for our fifth double header of the season! Doors open at 4 at the Knoxville Convention Center, Exhibit Hall B. Our featured charity of the night is A Step Ahead Foundation of East Tennessee which provides free birth control and transportation to any woman seeking long-acting, reversible contraception (LARC). Presale tickets are $10 adults/$5 kids, at the door they are $15/$10. Favorite skater is the theme, so draw inspiration from your favs and show them some love. Previous skaters get $2 off admission! Allstars play at 5 against the Richland County Regulators. Our second half of the night will consist of some good ol home team hash outs with bouts between the Lolitas Locas, Black Bettys and Machine Gun Kellys! Doors open at 4PM! See your favorite Hard Knox Roller Girl for $5 off pre-sale tickets! The theme is "Be Your Own Hero", so please come dressed up! 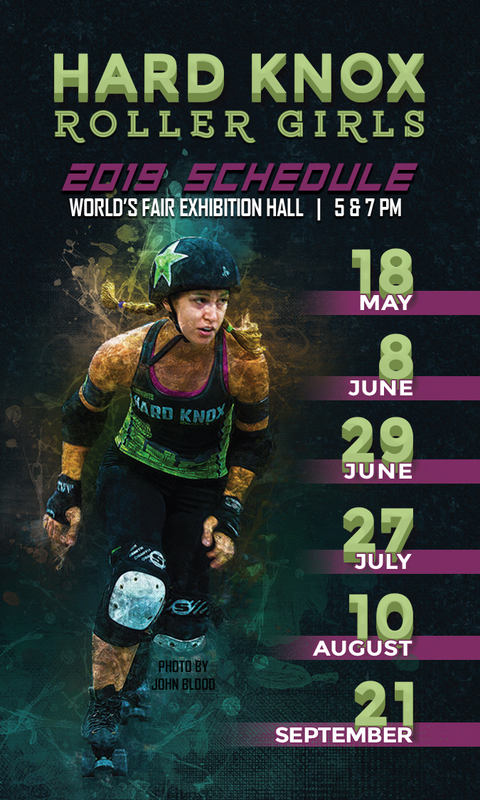 Hard Knox Roller Derby skaters will test their endurance! Skaters will skate as many laps as they can for the duration of this event. For each lap skaters take, donations are made to Hard Knox Roller Derby! Donations can be accepted the day of the event as cash or check. If you prefer, you can use the PayPal link below to donate to the league in the name of your favorite skater. Make sure to type their name in the "Purpose" section so we know who your favorite skater is! Purchase tickets at the door, from a skater or from our website.